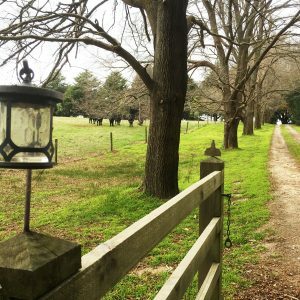 I am excited to invite you to a winter retreat in the rolling hills of South Gippsland to spend a little time focussing on Your SELF. I am very passionate about living lives we love, finding ways to navigate the world and the ‘musts’ and the ‘shoulds’ to find time and space to enjoy to grow, flourish really enjoy life. This weekend is crafted to allow you time to dream and design a life that really lights you up. Get to know yourself better and focus on what’s truly most important to you. This retreat is perfect for the woman who is in transition or looking for more out of life. Are you wanting more fun? Are you seeking more joy and feeling the need for greater connection? Are there too many issues fighting for your brain space? Are you searching for more meaningful and purpose driven experiences? I’d like to welcome you to my happy place, my home away from home, Elm Park . Two full days in my country studio, set on two acres of tree filled paradise. Here you will be supported and guided through a range of self-discovery experiences, a blend of coaching, relaxation and creative play. You will discover new ways to connect with your gut instincts and feelings, understanding hunger, nourishment and motivation from new perspectives. And you will rediscover and reconnect with matters of the heart in ways that make your heart sing. These experiences will be fun, creative, reflective and refreshingly free flowing, they will leave you feeling connected and aligned to what truly matters most to you. 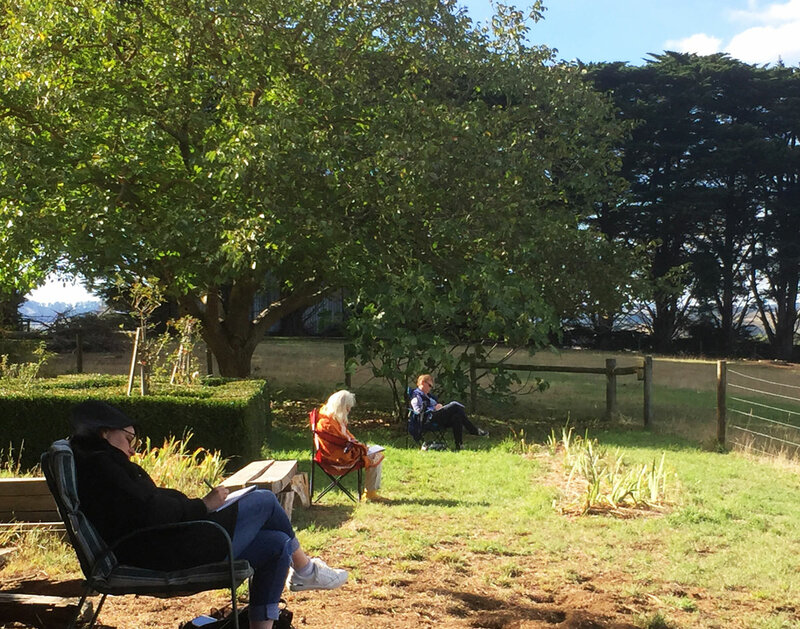 Retreat participants enjoying the sun and a short personal reflection exercise. You need no specific creative or artistic skills, just a curiosity and a willingness to explore new possibilities for yourself, your relationships, your career and your life. 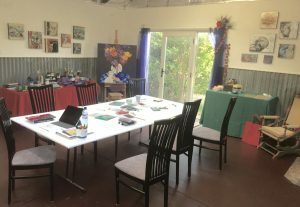 Take a breath, nourish yourself, unlock and release any stress and tension you might be holding in your body, in this relaxed and supportive environment, expertly, playfully and loving facilitated by me, Davia McMillan. Allow yourself to dream and design a life that really lights you up. Here is a collection of things people said about the retreat held in Autumn 2018. A profound experience. Very gentle and heart warming. Super insightful. Lots of food for thought and inspirational activities. I learnt so much about myself, what I want and how I might get it. So great to take some time just for me. Just what I needed. Perfect! Refreshments, tea, coffee and lunch will be provided each day, as will all the necessary materials for activities. There are many lovely B&B options available in the area. I can provide you with a list or visit www.airbnb.